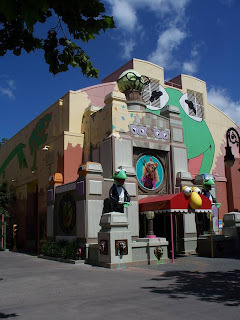 We all know that MuppetVision 3D, as well as the Muppet Stuff store, have some of the best gags on property anywhere. We’ll go through a lot of them together over time, and that will take a while because listing gags when Muppets are involved is almost as tiresome and time consuming as singing it’s a small world. Today though, let us start with one of my favorites. 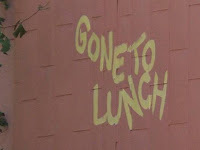 It can be found right across the walkway from the exit to MuppetVision, along the side wall of Muppet Stuff. I should take a moment here to tell you that if you have never taken a moment to pause and absorb every nuance you can of the outside of Muppet Stuff, I recommend you do, it is full of fantastic little witticisms. Here’s a nice clean shot I took to give you an idea, and even it does not do the real thing justice. Back to my favorite touch to Muppet Stuff, it is good to know the painter planned on coming back all those years ago when he went to lunch. As well, it appears as if he is truly dedicated to his task, or else why would he go through all that work? I mean, you don’t suppose that they painted that up there to give us all a good chuckle now and then, do you?